How one WorldVenture missionary is transforming the lives of children in Mali through Bible verse memorization. The children of Mali do not have a bright future. With overcrowded schools and multiple languages to learn, educational opportunities are limited so that few children pass their national exams. Without adequate education opportunities, many Malian youth have little to no hope of making an earning beyond subsistence farming, selling goods on the streets, or other trades. When WorldVenture missionaries Laura and Thomas Requadt moved to a small village in Mali, it wasn’t long before their home was a frequent stop for these West African youth. Laura offered them games, cookies, and above all, a chance to learn. While Thomas has dedicated his time to translating the Bible for the Shempire people, Laura has focused on the children. For the past 10 years, she’s been holding daily language and Bible lessons, making such a difference that everyone from Muslim parents to schoolteachers are noticing. 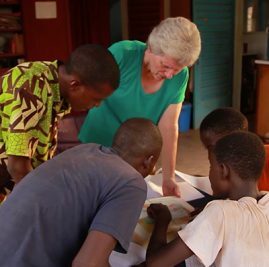 I sat down with the Requadts to hear more about how Laura is helping Malian children memorize the word of God and build a relationship with Him. The interview has been edited for length and clarity. Why is it so hard for children in Mali to receive a good education? The reading is in French and most of them don’t know French when they start. The classrooms are overcrowded; you can have 80 to 100 kids in a classroom. Some classes may have 100 or more. Most of the kids do not learn how to read and write simply because it’s too overwhelming for the teachers. How do you step in and help with this education deficit? I try to teach them to read in the major trade language, which is Bambara. Once they learn Bambara, I also work on teaching them basic French so they have a better chance of passing the national tests. The kids in our town rarely pass because everything is in French. What kind of futures do these kids have? If they don’t pass school, they’re going to have to do some kind of manual labor, selling, or a trade. Some of the kids who’ve gone through my class are mechanical apprentices. Others could become tailors, as all sewing is done by hand. You can’t get into college. It’s rough. You see a lot of kids in my class in the market selling stuff. What do you think would help these children? I really wish someone would come teach them electronics and technology. There are a lot of electronic devices now. Everyone’s got a cell phone; they’re starting to get smart phones, and they need people to help them use their smartphones to their advantage. It’s really hard…you have to be very enterprising to earn money in other ways besides farming. Every afternoon, you teach these kids a Bible lesson and work on memorizing verses. What does this time look like? We have kids of all ages coming over, from babies who can’t stand up yet to 16-year-olds. We do our memory verses in Bambara, which is a second language to most of the kids. I pick out 100 memory verses: verses that show Jesus is God, that Jesus is Savior. We often use John 1, John 3, and Romans 3. We also learn plenty of Hebrews, because Hebrews is really good for showing that Jesus is the ultimate sacrifice. How does the Malian culture make it easier or harder for children to understand the Bible? Are there any children who have really made an impression on you over the years? There was one 5-year-old in our neighborhood whose name was Bandit. If anything was going wrong in the neighborhood — if something was stolen, broken, set on fire — he did it. He was about 6 when he trusted Christ as his Savior, and the neighborhood noticed a difference. They trusted him to babysit their kids, and they hired him to do odd jobs, because there was just a complete difference in him. There was another kid, Zan, about the same age. By the time Zan was 7 or 8, he had learned to read enough that he could teach himself verses. Zan has really stuck with the Lord and is really focused on teaching other kids their verses. Although he really likes playing soccer, he says he would rather teach kids the Bible than play soccer. How do you measure whether the children you teach become followers of Jesus? I really can’t tell how many of them are really, truly trusting Jesus. The way this culture works, I can’t just ask, “Okay, raise your hand if you’re going to follow Jesus.” That method doesn’t work. They’d raise their hands because they think that’s what I want. We go more off of their lives changing and other people seeing that they’re following Jesus. Based on that, after more than 10 years’ time in Mali doing this, there are around 25 to 35 children who have showed a difference in life, although there may be closer to 100 who said they were going to follow Jesus. What does that difference in their lives look like in this culture? In their own words: “I don’t steal meat anymore.” They say they’re not as mean as they used to be. They don’t hit the other kids as much. They don’t cheat in school. They’re more respectful to their parents. These are the things the kids themselves and their parents have said. They do their chores without complaining. This one Muslim family sent their eight boys to our kids’ club because it had improved their behavior so much. We do have other Muslim parents that, although it had improved their kids’ attitude and their respectfulness, made them stop coming because other Muslim neighbors put pressure on them. We’ve had schoolteachers comment on how much better behaved a kid is in school now that he attends our class. That doesn’t mean he’s a Christian yet, but he’s at least learning how to behave in the classroom context. These kids live in a 95 to 100 percent Muslim context. How do you prepare them for the hostility they will face if they declare themselves followers of Jesus? That is one of the reasons for doing so many memory verses. One of the boys had memorized his 100 verses and got to take a Bible home. His big brothers took it away from him. Later on, he got another Bible, but he asked to keep it at our house. He needs to have these things in his head because he’s not allowed to have a Bible at home. Also for us, discipleship is not a one-hour meeting over coffee to discuss things. Discipleship is hanging out all day and seeing how we handle life. Can you really make your faith real to you and function in this environment? We get to work on regular ordinary life every day. The people of Mali desperately need the Bible in their own languages. We need people passionate about investing in the lives of Malians to go make a difference as teachers, translators, media workers, and other positions. Pray for the Requadts as they diligently work to bring the word of God to the people of Mali. Pray for God to send more people to Mali in order to proclaim Him in a dominantly Muslim country.